Over the period between Christmas and New Year in 2009/10 Kelly and I planned a camping trip to a bunch of national parks that we had not previously visited between the northern side of the Hunter Valley and a line west of Port Macquarie (click here to see articles on that trip). However, the weather had a different plan and flooding caused us to miss some sections of the trip and also not be able to do walks in other sections that we did visit. We decided soon after the trip to revisit the area over Easter 2010. Our first trip was done with our fellow dive club members, Ron and Donna, who also live at Kirrawee. Ron's brother, Eric, who lives near the parks we were going to visit also decided to come along with his wife Jane and children Tegan and Drew. Eric knows the area like the back of his hand so he worked out the itinerary for us. 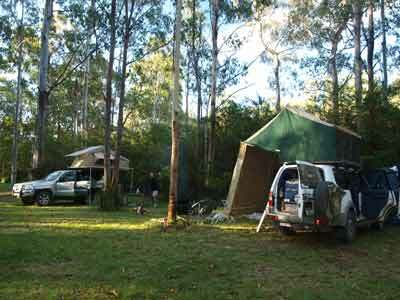 Ron has a Toyota Prado (2008) with a roof top tent and Eric a Land Rover Defender (2008) also with a roof top tent. The following is the story of our adventures. After a couple of months of relatively dry weather, it starts to rain on Monday 29 March 2010 around dinner time. Over the next three days it really pours, with over 56 mm falling at our place. I check the internet and find that some places up in the Hastings and Macleay River valleys have had between 75 and 95 mm over the same time. Typical, it rains a lot when we go on camping trips. As I said in the December 2009 trip report, Kelly says that she should hire herself out to farmers in drought areas as a rainmaker! Despite the rain, the forecasts are for not too bad weather over Easter up the North Coast. It is fine when we get up on Thursday morning, the rain seemingly gone. We leave home about 10 minutes late at 6:10 am and have a reasonable run across Sydney from our home at Kirrawee (in Sutherland Shire on the southern edge of the City) to Pennant Hills Road where we meet Ron and Donna for breakfast at the Thornleigh McDonalds where we arrive at 7:05 am. Ron left about 15 minutes before us and we speak to them on the UHF radio on the way. We leave Maccas at 7:25 am and are soon on the F3 at Wahroonga (on the northern edge of the city). Once on the freeway, the traffic is not too bad, about the same as a normal weekday outside peak hours. We make very good time and after a quick stop at Bulahdelah to purchase a newspaper and some magazines to read, we stop at the rest area just north of the town (outside the golf club). We get here at 9:50 am. We have a cup of tea (and hot cross bun!) and leave at 10:15 am. The traffic is pretty good, the only slow bits are where they are doing more roadwork on the Pacific Highway (some sections of which are limited to 40, 60 or 80 km/h for no obvious reason). 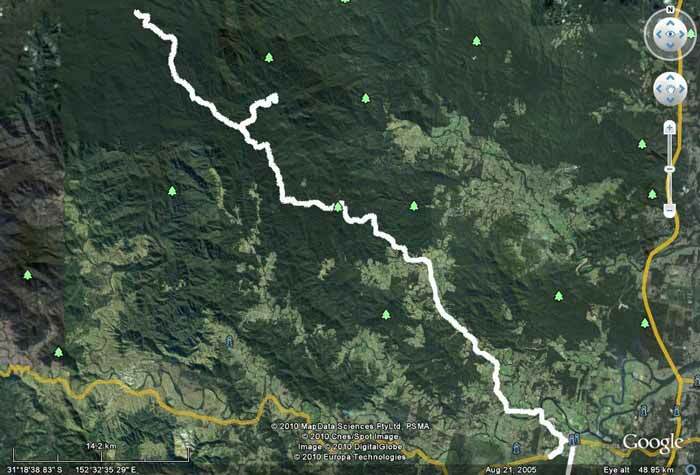 We arrive at Wauchope at 11:55 am. I have to refuel as I did not start with a full main tank. Ron does not need to get fuel here, and in fact, will do the whole trip without refuelling (he has the diesel with 2 x 90 litre fuel tanks). We both need to go to the supermarket to get bread and other perishables. We are back on the road at 12:15 pm. We travel via the Hastings Forest Way towards Werrikimbe National Park. On the way, we stop in the state forest and collect some firewood. We head to the Number 1 Fire Tower and arrive there at 1:15 pm. This is located at GPS S31° 17' 22.7" E152° 32' 12.1" (using WGS84 as datum), the access road coming off the main road a short distance away (the road is on your right and sign-posted). There is no actual fire tower here now, but it has great views over the whole of the Macleay and Hastings valleys and the coast. When we were here in December 2009, we could not see anything due to the rain and cloud, but today it is perfect. We have lunch here and take in the views. It is sunny and warm, about 26ºC. What a difference to last time. We leave at 1:50 pm and continue on the Hastings Forest Way. Ron spots a koala crossing the road and we stop and watch it quickly climb a tree. 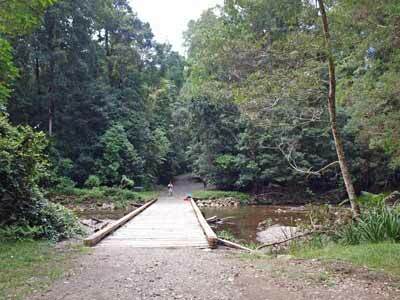 When we come to the Wilson River Road we turn right and head down it and cross the Wilson River. We park here at 2:25 pm. There are two very nice picnic areas here, both right on the river. When we were here in December, we could not cross the river as the causeway was so far under water to make it dangerous. 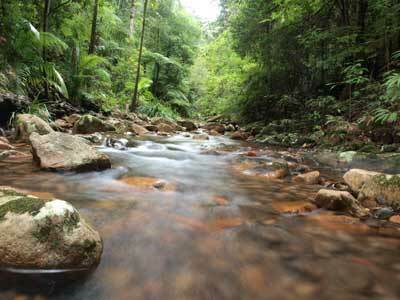 There is a walk here to a waterfall on Tinebank Creek. It is about 1.7 kilometres and it takes us 30 minutes to get to the waterfall. It is a very nice walk, with some excellent trees, lots of fungi and moss on the trees. There are some huge strangler figs that have totally swallowed the host trees. 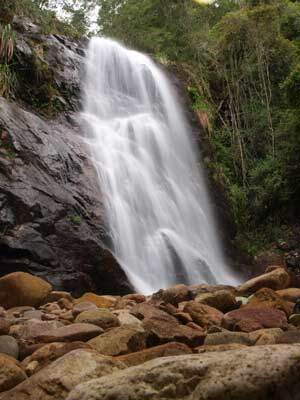 The waterfall is not huge, but it is very attractive and we get some nice photographs. We walk back to the car and then sit on the bridge to change our walking boots back to normal runners. We have all got some leaches on us, I had about 10 all up, one of which I deposit on the bridge. It then stands up vertical looking for some passing animal to grab hold of. Luckily none of the leaches had started to feed. It is a lot cooler up here, 20ºC at the most. We leave at 4:10 pm and drive back to Hastings Forest Way and then turn right. We pass the couple of trees that we had to move and cut last time and arrive at Brushy Mountain Camping Area at 4:55 pm. When we were here last time the water from the Forbes River (which runs along one side of the camping area) had flooded the whole area. After the rain of the last couple of days, there are some areas that cannot be used as there are large pools of water here and there. There is a family with a large tent next to the shelter shed (see the relevant page from the December trip - link above) and some young people on the other side. We find a spot and set up camp. As Kelly sets up our ShippShape tent, I investigate a problem I discovered when we returned to the car at Wilson River. It appears that my second battery is flat and the temperature in the fridge has gone up a little. I work out that there is no charge going into the battery and when I further trouble shoot, I find that the battery isolator in the engine bay appears to have failed. As such, there has been no charge going into the battery. I decide that I can temporarily solve the problem by taking the "out" cable and attaching to the "in" terminal. I run the car and sure enough, the second battery started charging. I leave it running and we decide to have a shower to take advantage of the engine running (and thus warming the water). I let the car run for about 30 minutes and the battery has enough charge to last through to the next morning. Drinks o'clock (5 pm) has already passed and due to the battery problem, we are late in breaking out beer and wine and some nibblies. I started a fire as soon as I fixed the battery so that we can cook a barbecue dinner. Kelly and I have some nice sirloin steaks and sausages and a rice dish. An excellent meal to start off the trip. The young group on the other side of the camping area has grown, with people arriving with things like large sofas, armchairs and more. Not only do they have a large dog with them (in a national park), they have a noisy generator which they run while a new arrival sets up his tent. It gets worse, with a twit in a hotted up Holden ute arriving. He then puts on his music and turns it up so loud that it is very uncomfortable. It is now after 9:30 pm and we are getting ready to go to bed. Kelly goes over and asks them to turn the music down a little. They do, but within 10 minutes it is louder than before. It is so loud we can here that they cannot even talk to each other as they are continually saying "what" to their fellow campers when they talk to them. I grab my big heavy torch and head over. I am pretty cranky. Kelly and Donna also come with me and Donna starts taking photos of them and their cars. I ask the owner of the car if he is deaf, he responds that he is. Smart arse! I really go to town and threaten them with all sorts of consequences if they do not turn the music down to a reasonable level. I am not sure if this is what works, but it may have been Donna taking the photos as they all complain about this. The music is turned down to a level that is comfortable for us and still loud enough for them to hear. We also hear them discussing what trouble they might be in if we use the photos. At 10 pm I go to bed and sleep very soundly. Kelly and the others say that the young people have a bit of an argument among themselves and the ute goes off to apparently collect more firewood. It is a cool night.